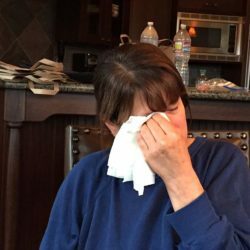 In April I was invited to join the 5 Star Makeover Challenge. A group of bloggers that come up with culinary topics each month, for members to create dishes and share at the end of the month. In April the topic given was Restaurant Wars. Members were divided up into teams of 3 and each team was asked to create a theme or use a specific ingredient, plus name their restaurant. We had until June to present it. Our team elected to do a menu of Raw Food and the name of our restaurant was “Eating In The Raw.” Unfortunately due to circumstances out of our control, we had to bow out of the event. However, since I already put my dish together, I decided to share it with you today. You can view other team creations here. We were to make an appetizer, entree’ and dessert. I was elected to make the dessert. The raw food diet is based on the belief that the most healthful food for the body is uncooked. Although most food is eaten raw, heating food is acceptable as long as the temperature stays below 104 to 118 degrees Fahrenheit (the cutoff temperature varies among those in the raw food community). Cooking is thought to denature the enzymes naturally present in food. According to raw foodists, enzymes are the life force of a food, helping us to digest food and absorb nutrients. If we over consume cooked food, our bodies are forced to work harder by producing more enzymes. 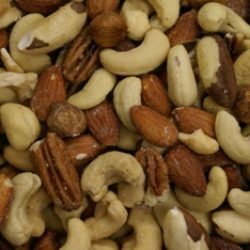 Over time, a lack of enzymes from food is thought to lead to digestive problems, nutrient deficiency, accelerated aging, and weight gain. 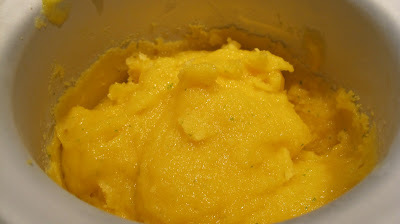 I decided to make a Mango Sorbet and after a bit of research I came up with this dish. Peel the mangoes and cut the flesh away for the pit. (Facts about and directions for cutting a mango). Can serve immediately or remove from ice cream machine and place in a plastic container with lid and place into the freezer until ready to serve. Let set out for about 15 minutes to soften before serving. Puree the raspberries, water, and agave nectar in a food processor until smooth. Then, strain through a fine mesh strainer to remove the seeds. Press the solids against the strainer to get as much of the sauce as possible. 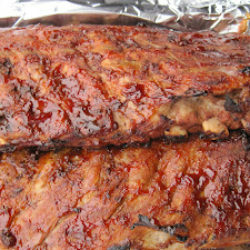 Pour into a squirt bottle if you have one, this makes decorating the plate with the sauce easy. The raspberry sauce can be made ahead and refrigerated for up to 2 days. Cut off top and bottom of a fresh pineapple, then cut off the sides just leaving the flesh. With a mandoline, starting at the top or bottom slice 1/8-1/4 inch slices. (You may need to shape the sides of your pineapple to fit the top of the mandoline so the pineapple can slide easily). 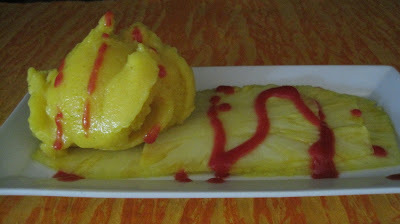 Lie one slice of pineapple at one edge of the plate then slightly overlapping add 2 more slices. Place the 4th slice on the opposite edge of the plate lying flat. 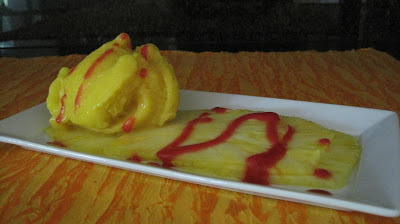 Place a scoop of Mango Sorbet on the flat piece of pineapple. Drizzle with Raspberry Sauce. Serve. 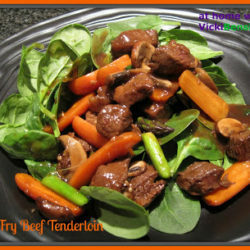 Each component of this dish is delicious on it’s own and can be served numerous ways, so let your creativity flow. If you prefer not to use agave nectar where it’s used in this recipe you could substitute honey or sugar (double the amount of sugar). 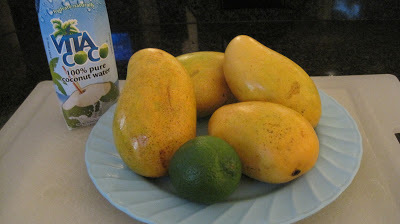 Looks wonderful and I just happen to have two HUGE mangos sitting in the fruit bowl, hmmmmmmm……. Mmmmmmmm ….. It looks refreshingly delicious ! Vicki, I saw this super restaurant challenge and sorry your team had to bow out but so glad you’re sharing this exotic dish with us! You’ve convinced me about the enzymes and eating raw food. Pass a plate of this beautiful combination every day and stay young and healthy forever! 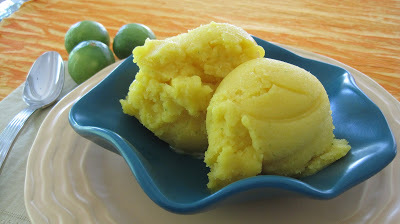 I just love everything in this sorbet!!! Beautiful pics! This looks SO VERY GOOD! It would definitely get my vote in Restaurant Wars! Glad you went ahead and posted it. I would have hated to miss it! Cool and refreshing for our hot weather. Oh, that textured has me filled with wonderful possibilities! This looks absolutely wonderful! Raw or not, I wouldn’t hesitate to eat it. I’m so glad you all like this. It is a bit of sunshine Angie and Jill after you mentioned about the mandoline I realized I didn’t post a link to Mandoline’s so I’ll have to go back and add it. Yes you do have to be careful when slicing. Although when you have a large piece like a pineapple you do have some wiggle room so to speak. However, when you get closer to the blade it’s important to use the guard if yours comes with the mandoline, otherwise, stop slicing when it gets too low. Beth I agree there’s nothing offensive in this dish. Raw or not I think the only ingredients that might be different are the coconut water and agave nectar, in which case you could use honey or sugar. If using sugar you would need to blend the water and sugar together so it dissolves first, before adding the other ingredients. I feel sorry that your team has to bow out from the challenge but happy that you are sharing your dish with us. I will check other creations after writing this comment. You have created a delicious dessert with mango, pineapple and coconut water combo. There are lot of mangoes things going on in my house. this is a new one for me to try. Seems like everyone did so well. there were more mango related dishes.I personally liked the squash blossoms with goat cheese because that reminded me of a similar dish which my Bengali neighbor in India would make with paneer. Yes, blossoms are eaten in India. This looks super – I love mango. And pairing it with pineapple is a nice touch. Good presentation, too. Sorry to hear your team had to drop out of the competition, but glad you shared this with us! 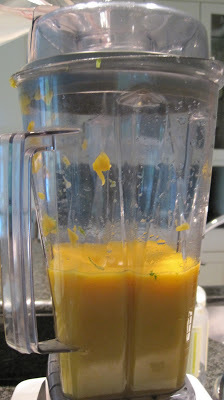 Mango and pineapple sound like a killer combination. Really unfortunate the event didn’t work out. It sounds like a great idea. This looks delicious and you have just given me ideas to work with pineapple carpaccio the next time I make a roast pork at home. 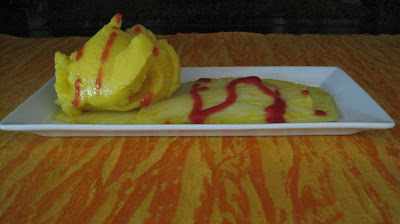 I like the combination of pineapple and mango, might have to dust off the mandoline, lol! This looks so wonderful and tropical! I really need to try it out soon. Thanks for visiting my blog and leaving such a sweet comment. 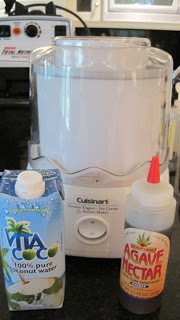 You need to link up this sorbet to the ice cream bloghop on my blog! love this dessert – so fresh and tropical, perfect for summer! I haven’t had too many mangoes this year yet. 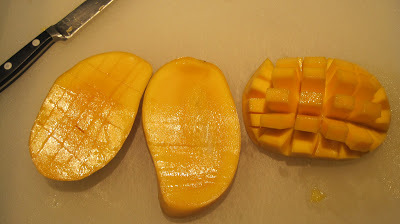 Your juicy mango pictures made my mouth water and I love your mango sorbet! Lovely summery dessert! Must get myself an ice-cream machine!